China should be more aware of the risks associated with its “Belt and Road Initiative” and how it affects local communities overseas, observers said after Pakistan, which is home to the ambitious plan’s largest projects, expressed concerns about some elements of the deal. While the new leaders of the South Asian nation, President Arif Alvi and Prime Minister Imran Khan, on Sunday reconfirmed their commitment to the China-Pakistan Economic Corridor (CPEC), local officials reportedly told visiting Chinese Foreign Minister Wang Yi that they also planned to review or renegotiate some of the agreements under the US$62 billion deal. Wang, who completed a three-day visit to Pakistan on Sunday, responded by saying at a joint press conference with Pakistani Foreign Minister Shah Mahmood Qureshi, that the CPEC plan had “not inflicted a debt burden on Pakistan”, while China’s foreign ministry spokesman Geng Shuang said on Monday that the two countries were still in talks on the future development of the CPEC. Before his election victory last month, Khan was a strong critic of his predecessor’s handling of Chinese investments. Experts said, however, that his past criticism was mainly related to domestic politics, and predicted the former cricketer would continue to support the CPEC as it had helped fund Pakistan’s development and boost its economic growth to nearly 6 per cent. 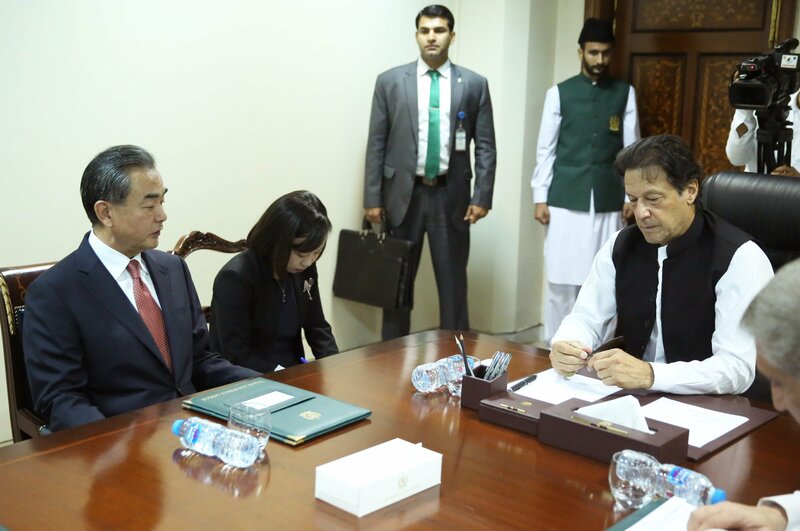 Wang Dehua, a South Asian expert at the Shanghai Municipal Centre for International Studies, said Khan’s current concerns mostly related to how the money was being allocated. “There were problems that the projects and investment were not equally distributed among provinces and regions to benefit more people, so Khan and his party will demand some changes,” he said. Sun Shihai, a specialist in South Asian affairs at the Chinese Academy of Social Sciences, said that even if some projects within the CPEC did need to be changed or redesigned, it would not affect the overall programme or the China-Pakistan relationship, and could be resolved through friendly negotiation. “But China should also learn a lesson, that they should take into consideration the needs of locals, their internal politics, and the debt paying ability when promoting the BRI [Belt and Road Initiative],” he said. Beijing should also give more thought to the possible downsides of high risk investments in belt and road projects, said Zhao Gancheng, head of South Asia Studies at Shanghai Institutes for International Studies. “Given the high profile of the CPEC, China will try its best to keep it going and prevent any negative spillover into other BRI projects,” he said. However, while difficulties with the CPEC were manageable thanks to the close political and military ties between China and Pakistan, if such difficulties arose in “a country that doesn’t have such close ties, the potential problems would be much worse,” Zhao said. The concerns over China’s belt and road plan in Pakistan come after a series of recent setbacks in other countries. Malaysia last month suspended the China-backed US$20-billion East Coast Rail Link and two pipeline projects worth over US$2 billion citing cost concerns, while Myanmar decided to scale back plans for the Kyauk Pyu port development due to debt risks. Meanwhile, the fate of two hydropower projects in Nepal is unclear, while a rail link through Laos could end up costing half of its gross domestic product. Under the framework of the CPEC, China has so far invested US$19 billion in 22 projects, nine of which have already been completed, with 13 under construction and others planned. Speaking at a press conference, spokesman Geng said the next focus of the CPEC would be a series of projects related to industrial cooperation and improving local people’s livelihood. “The two sides will discuss and confirm the future road map and direction of the CPEC in accordance with Pakistan’s economic and social development focuses and the needs of the people,” he said, adding that agriculture, education, medicine and drinking water would be areas for development. The CPEC has so far focused on large-scale infrastructure projects, including the expansion of the Gwadar port on Pakistan’s south coast, roads and railways linking the Chinese border to the Arabian Sea, and several power plants.